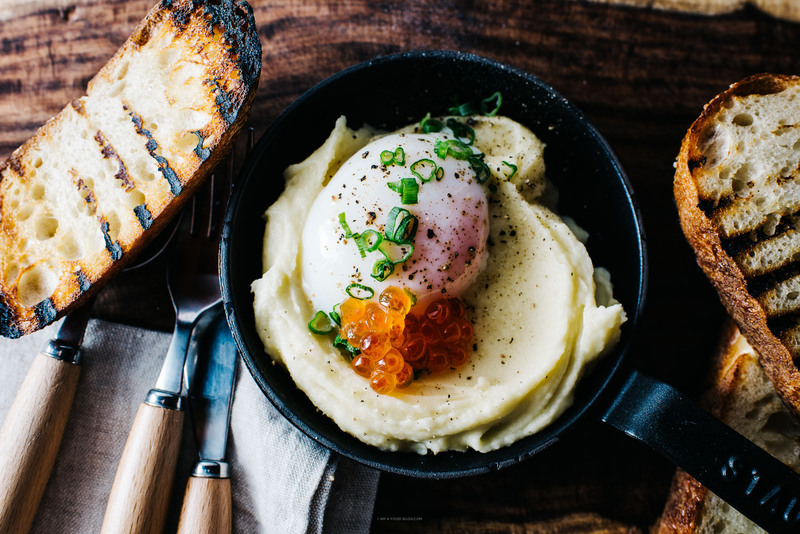 A 64° sous vide egg on top of the smoothest, butteriest mashed potatoes, served with grilled sourdough toast. A 64° sous vide egg on top of the smoothest, butteriest mashed potatoes, served with grilled sourdough toast. A combination of all the things I love: eggs, potatoes, and toast. 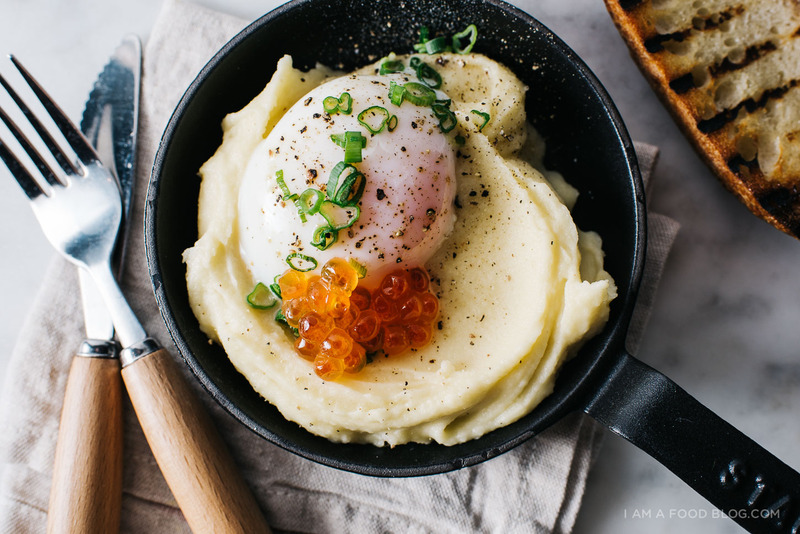 These mashed potatoes are an ode to mashed potatoes. 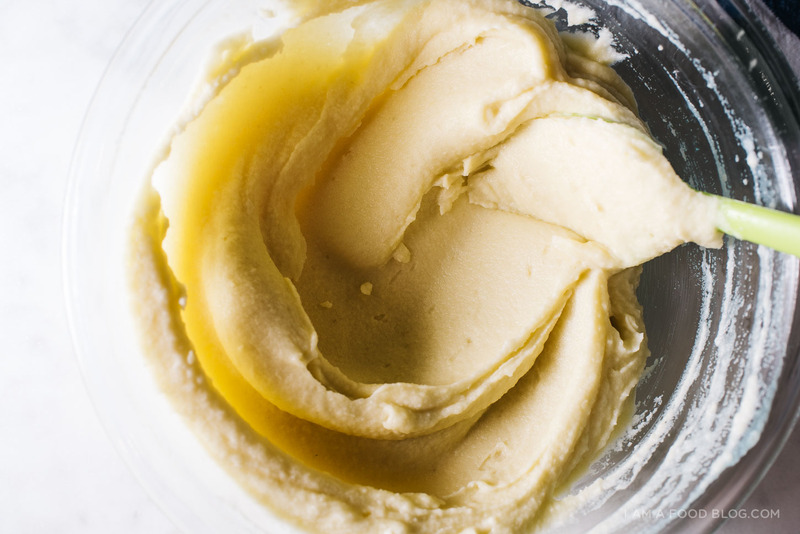 Smooth, creamy, and undeniably potato-y. They’re based on Heston Blumenthal’s mashed potatoes. The potatoes are sous vide at 72°C, which locks in the starches and ensures that the potatoes are smooth, but not gummy. The starch in the potatoes gelatinizes and the granules that contain the starch firms up, ensuring that the potatoes don’t gum up during mashing. After the sous vide, the potatoes are finished cooking in regular boiling water. Then you rice them and fold with butter and milk that’s been steeped with potatoes skins for some extra potato-y flavor. 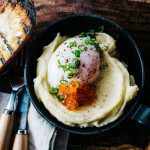 After the potatoes are done, a perfectly jammy sous vide egg goes on top, then some salmon roe for pops of brightness. Everything gets scooped up with crispy toasted sour dough. Trust me, it’s heaven. To sous vide the eggs: Fill a large pot with water and set the sous vide machine to 64°C. When the water reaches 64°C, gently place 6 eggs, straight from the fridge, into the water. Set a timer for 43 minutes. When the 43 minutes are up, remove the eggs from the water bath and plunge into an ice bath. 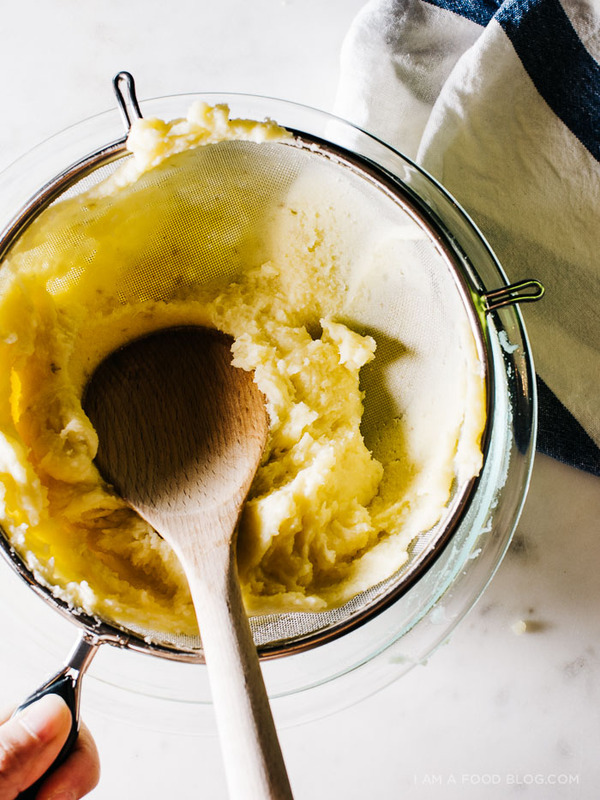 To make the mashed potatoes: Bring a saucepan of unsalted water to 72°C over a medium heat. Or use a sous vide machine to bring water up to 72°C. Cut the peeled potatoes into equal-sized pieces, rinse for 5 minutes and put into the pan and bring the water temperature back up to 72°C. 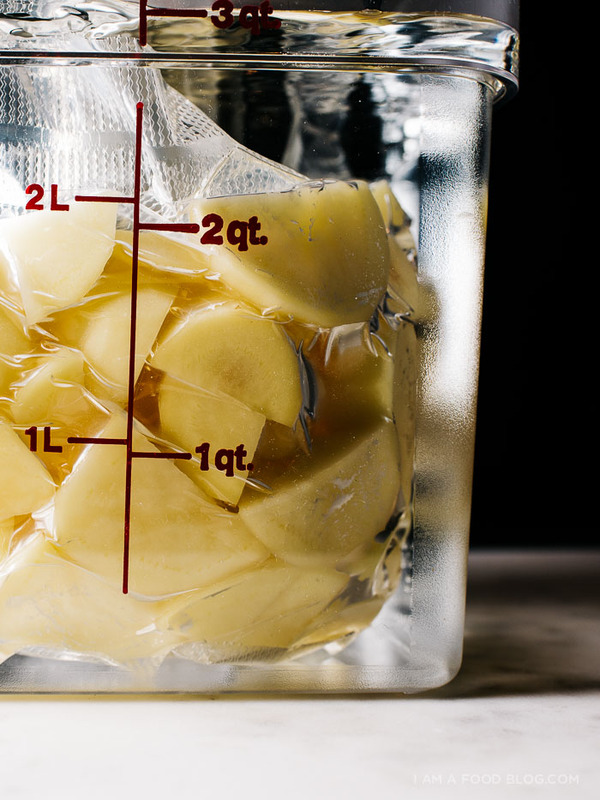 If using a sous vide machine, place the potatoes in a vacuum sealed bag. Hold the potatoes at 72°C for 30 minutes. After 30 minutes, drain the cooked potatoes and rinse under cold running water. Meanwhile, add the potato peels to the milk, bring to a boil and remove from the heat. 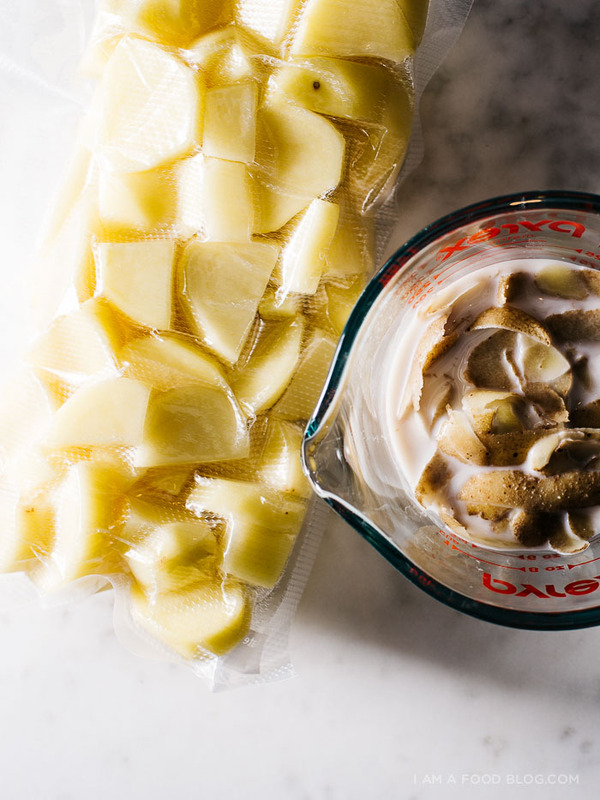 Allow to steep for 20 minutes before straining and discarding the peels. Drain the potatoes, and return to the pan over a very low heat to dry out slightly. 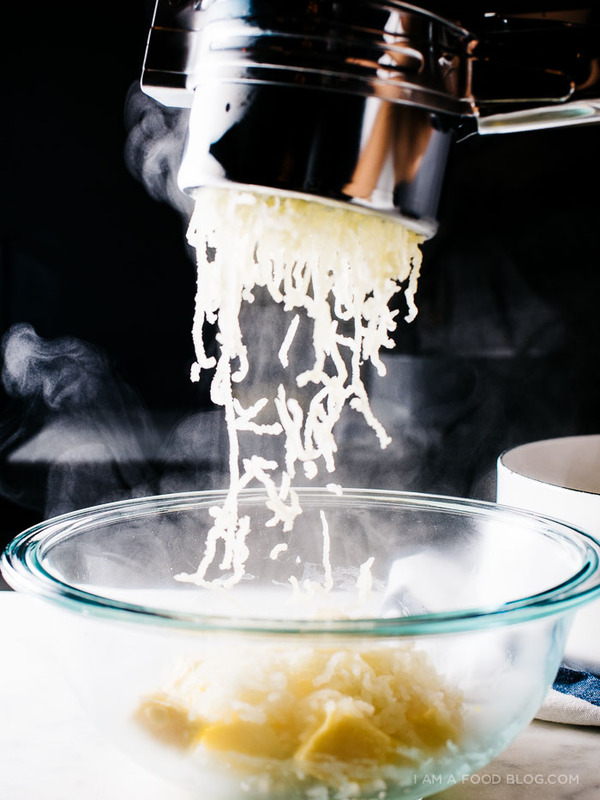 Use a ricer and rice the potatoes onto the butter in a bowl, and fold together, push the mixture through a fine sieve add the warmed infused milk and salt to taste. Heat up the eggs by placing in very hot tap water. Crack the eggs into a small dish and tip the dish slightly to pour any loose whites. Place a small dollop of potatoes in a bowl and gently slide the egg on top. Season with salt and pepper to taste and top with fresh herbs and salmon roe. Serve with hot grilled sourdough toast. Notes: Potatoes based on Heston Blumenthal’s Perfect Mash. 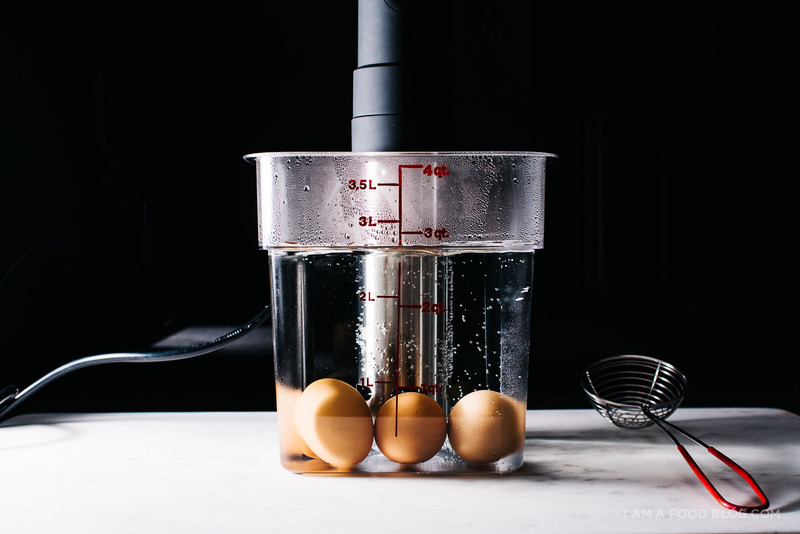 For the eggs, if you don’t have a sous vide machine, you can try this slow-poaching method.